WEST LAFAYETTE, Ind. — Purdue police are encouraging the university community to register for an online program aimed at helping get lost or stolen laptop computers and bicycles back to their owners. Links for “Easy Bicycle Registration” and “Laptop Computer Registration” are at the bottom left corner of police department’s Web site (http://www.purdue.edu/police/). 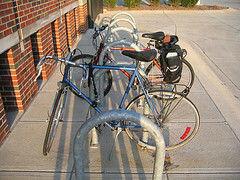 Bicycle registration has been in place several years, and the laptop program was launched in 2008. Nearly 7,000 bicycles and 4,000 computers have been registered, including nearly 600 bikes and 1,000 laptops since Aug. 15. Laptop computer registrants will be asked to provide the serial number and make and model. After the online form is submitted, the owner will receive confirmation that the registration is on file. While the program is designed for laptops, desktop computers can be registered, as well, Chin said. For bicycle registration, individuals can pick up a sticker at the police department, 205 S. Martin Jischke Drive. The department will log the sticker number and information into a database.